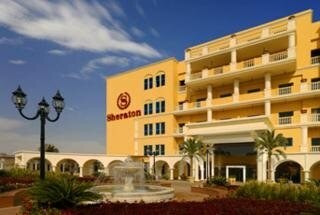 The Sheraton Dreamland Hotel offers stylish accommodation to leisure and business visitors to the region of Giza, close to Cairo, capital of Egypt. 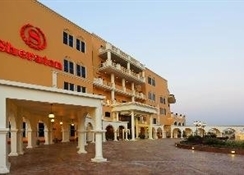 The hotel is located within the community of Dreamland in 6th October City, a large amusement & entertainment complex. The Sheraton Dreamland Hotel offers 166 attractive rooms and suites of generous space, and complemented by fine dining options, social bars, a terrific pool and sun terraces (including separate kids pool), and great Spa and fitness facilities. 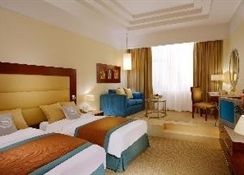 Stay in style and enjoy Egypt when you book into the Sheraton Dreamland Hotel with easy access to so much entertainment. Getting to the hotel: 55km to Cairo International Airport. 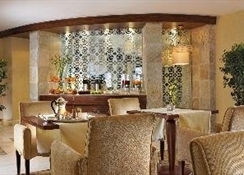 Local tips: The hotel is set in 5 acres of landscaped gardens; located 8km from the Pyramids of Giza; and 30km from downtown Cairo. Food, drink and entertainment: 24 hour main restaurant serves breakfast & dinner buffet-style international & Mediterranean cuisine and provides live singing/dancing entertainment, Asian cuisine restaurant, traditional Egyptian cuisine restaurant, and terrace and pool bars. Sport, games and activities: Lotus swimming pool, outdoor Jacuzzi & waterfall pool, sun terraces, loungers & parasols, Fitness Centre: a variety of massage & therapy treatments available, sauna, steam room, and state-of-the-art gym equipment; and Dreamland golf course. For the kids: Children's pool & Jacuzzi (seasonally heated), and babysitting service (upon request). 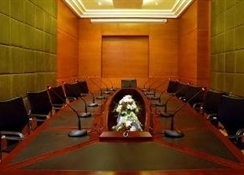 Additional: 24 hour Reception Services, housekeeping, 24 hour Concierge Service, 24 hour room service, medical services, Business Centre, high-speed internet access, ATM machine, car rental, valet parking, and 5 meeting rooms for up to 400 people, with A/V equipment and staff to organise your event. Guest rooms and suites have a bright contemporary feel, with colourful furnishings, drapes and fabrics creating a warm and friendly ambience, soothing wood tones and carpeted floors for your comfort, and modern conveniences for your enjoyment; features in most rooms include a private furnished balcony/terrace, individual air-temperature controlled air-conditioning, en suite bathroom with bathtub or shower & hair dryer, twin and queen-size beds, high-speed internet service, LCD satellite TV, mini fridge, safe box, iron & board, and tea & coffee making facilities. 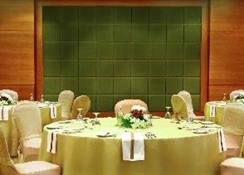 Club rooms & suites enjoy upgraded amenities and services.